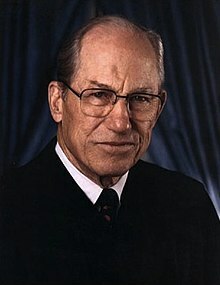 Byron Raymond White (June 8, 1917 – April 15, 2002) was an American judge and former football player. he served as an associate justice of the Supreme Court of the United States. He was appointed to the court by President John F. Kennedy in 1962. He retired in 1993. Before becoming an associate justice, White played for the Pittsburgh Pirates in 1938 and for the Detroit Lions from 1940 to 1941. He played as a halfback. White died in Denver, Colorado from pneumonia, aged 84. This page was last changed on 4 May 2015, at 13:08.